The Ergoline Soltron 50 gives you all the party power you need. With three 400W facial tanners and 38 high-tech lamps - 22 lamps with up to 160W in the canopy and 16 two-metre lamps at up to 180W in the base. 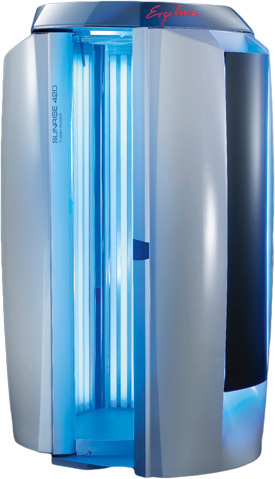 Very efficient high-pressure lamps at 400W each to the face in innovative Ultra Performance PLUS technology (including two 8W low-pressure UV-B lamps) for tanning power to the new standard using all that the lamps have to give. Air Condition breathes a cooling breeze to the skin. Optional Power Sound System with SD card slot, MP3-Dock and Subwoofer pumps out that perfect sound. 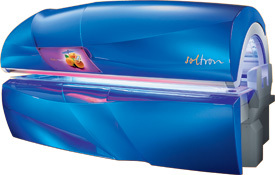 Rise And Shine The Sunrise 420's Turbo Power, 2-meter tall, 200-watt tanning lamps provide a deep all-over tan that is achieved in a quick tanning session. For music enjoyment, Stereo Sound is available. Also available is a 3D-Sound system with MP3 dock-in and SD card slot. This allows clients to listen to their own mix of music through this acoustically incredible system. And your customers will easily be able to hear music while maintaining a comfortable body temperature thanks to the Sunrise series’ Silent Cooling system. This system bathes the entire body in a pleasant flow of refreshingly cool air, yet is whisper quiet.